1. Take the steak that you marinated overnight and place it in a skillet on medium high heat. (I used my cast iron, but any will work) Cook it about 2 minutes and then flip over and cook about 2 minutes. 2. Put the steak on a cutting board and cut it up into small pieces. Place back in skillet with diced onion and saute in a dash of oil until the onions start to go tender. 3. 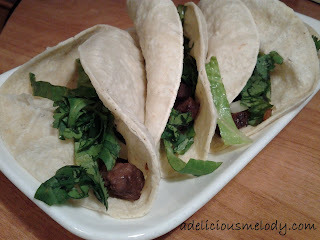 Fill corn tortillas with shredded lettuce, steak/onion mixture and then top with peppers and cilantro. 4. Serve immediately, and enjoy! You can serve rice and beans along side to complete the meal. Corn salsa, pico or other salsas would go well with these too!